Arm yourself with these cool things to know about this awesome creature. With its strange-looking body, an octopus looks kind of like an alien. Lots of people think that the big sac-like part above the octopus’s arms is its head. But the sac is actually called the mantle. The octopus’s stomach, gills, and some other parts are inside it. The head is much smaller and is located where the octopus’s eyes are. An octopus gets its name from its eight long arms. 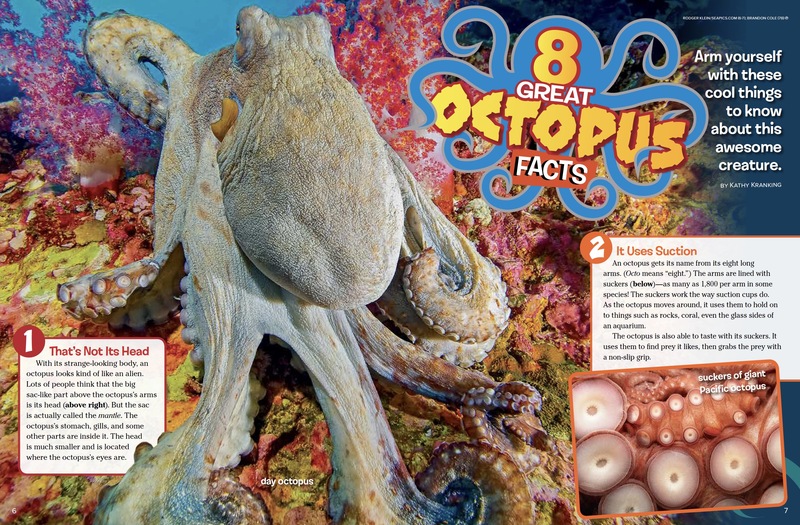 (Octo means “eight.”) The arms are lined with suckers—as many as 1,800 per arm in some species! The suckers work the way suction cups do. As the octopus moves around, it uses them to hold on to things such as rocks, coral, even the glass sides of an aquarium. The octopus is also able to taste with its suckers. It uses them to find prey it likes, then grabs the prey with a non-slip grip. An octopus has a built-in “tool” that it uses to swim. It’s called a siphon (SYE-fun), and it’s a tube coming out of the octopus’s mantle. When an octopus needs to move fast, it shoots water out of the siphon. The force of the water going backward pushes the octopus forward. The octopus can move the siphon around to swim in different directions. When the octopus is threatened by an enemy, it shoots dark, inky stuff out of the siphon. The ink can confuse or distract a predator, giving the octopus a chance to get away. Because an octopus has no bones, it’s almost totally soft and squishy. Except for one thing: a parrot-like beak hidden on its underside in the center of its arms. The beak is hard and sharp—great for tearing the flesh of prey. The octopus at top right has just “parachuted” down onto its prey, a crab trapped under its webbing. Sometimes an octopus uses its strong suckers to pull open the shells of prey. Other times it uses mouthparts covered with tiny teeth to drill through the shells. Then it shoots venom inside to keep the prey from moving and to soften its insides. In the photo at far right above, you can see a prey’s-eye view of an octopus as it eats a crab. Bye-bye, crab! 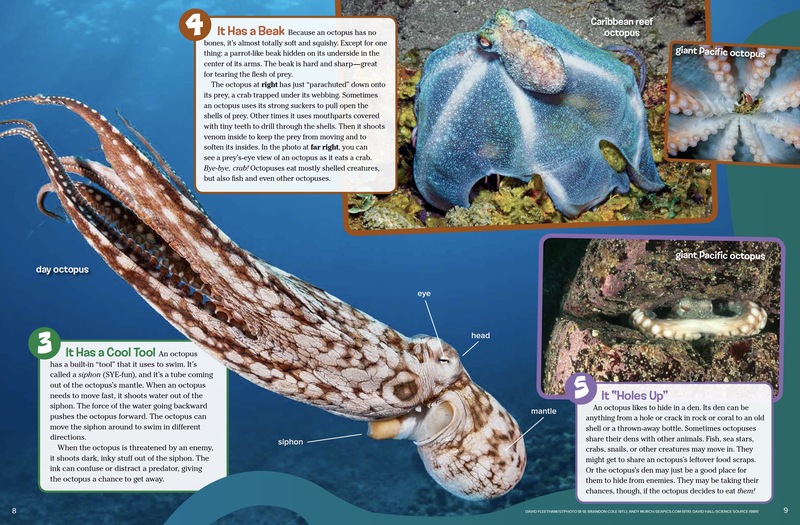 Octopuses eat mostly shelled creatures, but also fish and even other octopuses. An octopus likes to hide in a den. Its den can be anything from a hole or crack in rock or coral to an old shell or a thrown-away bottle. Sometimes octopuses share their dens with other animals. Fish, sea stars, crabs, snails, or other creatures may move in. They might get to share an octopus’s leftover food scraps. Or the octopus’s den may just be a good place for them to hide from enemies. They may be taking their chances, though, if the octopus decides to eat them! Can you find the octopus hiding among these sponges? Hint: It looks like a white sponge with eyes! An octopus is a master of disguise. It can change the surface of its skin to look bumpy, smooth, or even prickly to match coral or other things. And it can change color, too. See the same octopus go from bright and colorful to nearly invisible in less than a second, as shown in the circles. Being able to disappear can help an octopus stay safe from enemies—or hidden from prey. This octopus found a shell to hide in. Then it cleverly brought another shell over to use as a roof. Octopuses are the smartest of the invertebrates (in-VUR-tuh-brits), or animals without backbones. They can find their way through mazes, open jars to get food, and solve puzzles. They’re also great escape artists. One clever octopus in a lab would escape from its tank each night to eat animals in other tanks. Then it would return to its tank before the scientists arrived in the morning. Tricky, huh? 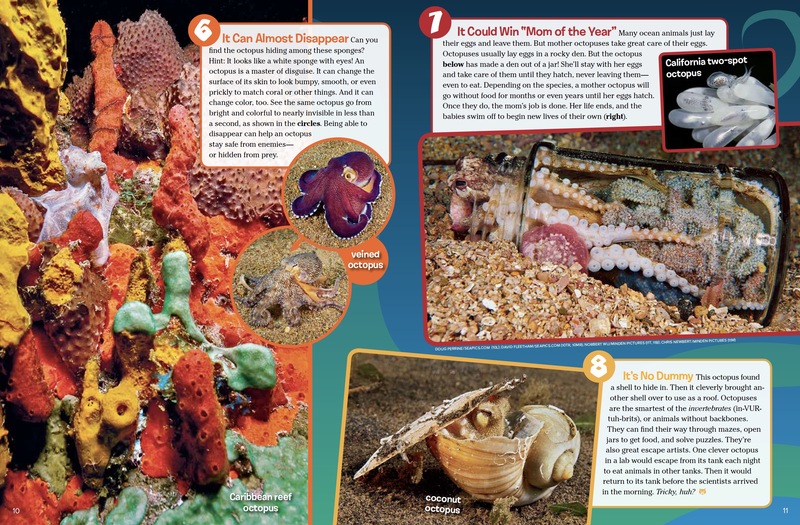 “8 Great Octopus Facts” originally appeared in the February 2017 issue of Ranger Rick magazine.